One of the definitions of the word engagement is “to attract and hold fast.” This implies that there are two laws at work in true engagement: attraction and retention. Engagement isn’t just about getting someone’s attention, it’s about holding his or her attention long enough to create sustainable value–be it financial, transactional, emotional or relational. It’s about creating something both valuable and desirable. Imagine two circles. 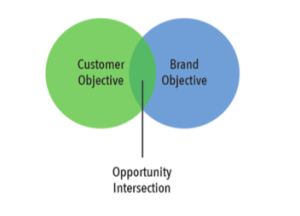 One represents the customer’s objectives, the other represents the brand’s objectives. Engagement opportunities exist anytime these two circles intersect. The goal of any opportunity intersection is to create meaningful engagement. Meaningful engagement is when the needs of both the customer and the business are met in a sustainable way–providing value for all stakeholders. What Makes a Moment Matter? Moments That Matter℠ hold the potential for a meaningful connection with your customer. Humans create meaning to connect their experiences and interactions to their needs, desires and deeply held values. In the same way, Moments That Matter provide brands with the opportunity to meet needs, fulfill desires or exemplify shared values. Moments that meet needs matter because they relieve or prevent pain or inconvenience. Since most companies are built on a value proposition that solves a customer problem, many brands make the mistake of thinking that this core problem, like securing a mortgage, filing an insurance claim or visiting the doctor, is the only moment that matters. But in order to meet the needs of customers completely, the moment has to extend beyond just the transactional need to emotional needs as well. For example, a person who has just purchased a home not only has a need to set up their online bill payment account, but they also need help navigating their new neighborhood. When the customer’s needs are considered more fully, we find that the greater opportunity for meaning often lies in preventing a problem with helpful reminders and preventative services or mitigating a problem that has already occurred with thoughtful customer service. Moments that fulfill desires matter because they demonstrate deep empathy and understanding of what the customer truly wants to accomplish or feel. These moments can also address goals and desires not even fully recognized by the customer themselves. By tapping into the human need to be known and understood, these “surprise and delight” or “above and beyond” interactions can galvanize customer loyalty and lead customers to engage in viral, word-of-mouth evangelism for your brand. Moments that exemplify shared values matter because they create a sense of purpose and community. People long to belong. When your organization demonstrates what matters most to you, it resonates with those who also hold those deeply shared values. The result is a relationship built on more than a transaction–it’s built on trust.